Sleepy students at the University of Michigan's Shapiro Undergraduate Library (better known as the UGLI to students) can now take advantage of a napping station. When Adrian Bazbaz transferred from a college in Mexico to University of Michigan, one thing struck him: how late students stayed up studying in the library. "I wasn't used to that at all. It was super late and so many people were there," he recalls. "Sleep deprivation is bad for your health and overall performance." Bazbaz, a junior studying aerospace engineering, thought that if students were going to stay up through the night studying, they should at least have the ability to take naps — and not ones that consisted of them drooling onto a textbook while slouched over at a desk. 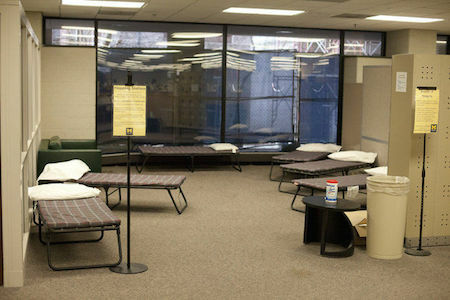 That's when the idea of a napping station at U-M's Shapiro Undergraduate Library was born. Bazbaz and Central Student Government, of which he is a participant, are piloting a napping station at the library. Then he strolled across the dayroom to the hypnoteleset, punched his clock number for a half-hour of trance and slid under, with the rest of the viewers. Two more were gaping, glassy-eyed, before a teleset, obviously in trance state.